Like the land of Gujarat the costumes of Gujarat also show huge variety in color and form. You will see the fine threadwork that comes in different kinds to decorate the costumes of Gujarati people. The use of beads and small pieces in embroidery is a specialty of Gujarati embroiders. The most common type of Gujarti costume worn by men is called Chorno. This dress is a cotton drawer which is mainly worn by rural men of this state. A short kediyu or angrakhu is pout over the Chorno to cover the upper part of the body. People of Gujarat who are engaged in agriculture are seen to wear a typical head dress or turban. This turban is named phento and is a thickly folded piece of cloth. Generally, Gujarati men prefer to wear dhotis with long or short coat and a turban. But like most of the states in India these traditional costumes of Gujarat are gradually being replaced by western casuals. 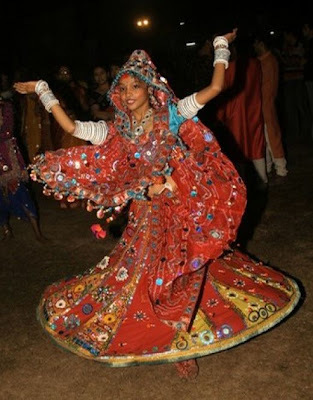 The females in rural part of Gujarat commonly wear chaniyo, which is colored petticoat embroidered with glass pieces. They wear a blouse, named choli, which is embroidered in a similar fashion with glass pieces that give a glittering effect to it. Along with this blouse and petticoat women also take a chunri, which is a colored coarse cloth long enough to drape around the upper part of the body. 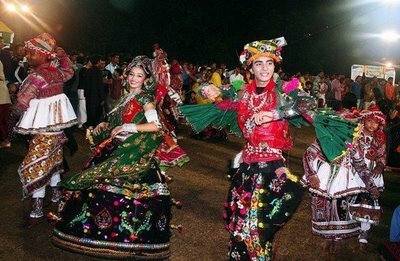 Ras and Garba are the popular Gujarati festivals when people come to a mood to celebrate. Different clothes are put on during these occasions of celebration. The Ras festival is regarded as the dance Lord Krishna performed in Ras Leela when he led a life of cowboy in Gokul and Vrindaban. The typical male costume for this folk dance is a small coat named Keviya. Keviya is a tight long sleeved coat with frilled pleats at its wait. The borders and shoulders of Keviya are embroidered heavily. A tight churidar and a colorful turban are put on along with the Keviya. A colored waist band making a contrast with white keviya and churidar is worn to make the overall appearance bright. 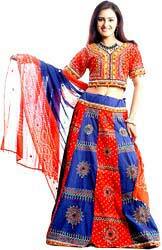 The Gujarati females are seen in lehenga choli or Ghagra choli during this festival. 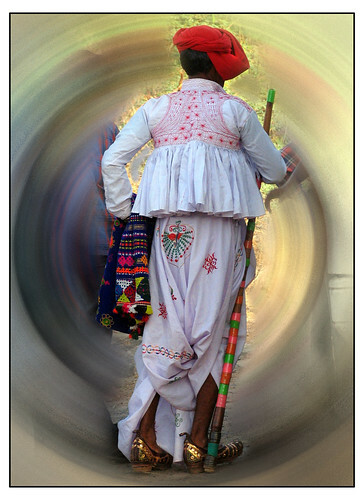 The cholis are barebacked and are embroidered heavily with colorful threads are glass pieces. To complete the attire females use a veli cloth or dupatta, which is a long piece of cloth, worn across the neck. 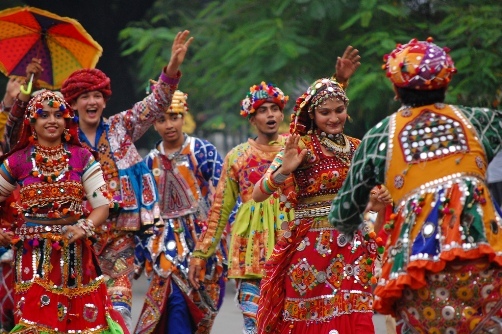 Unlike the daily wear of Gujarati women, the costume for this festival is extremely colorful. Abhas is the traditional costume of Kutch region that nowadays in vogue. This exquisitely styled garment is adorned with glass pieces which gives it a shimmering effect. In the villages of Kutch region Abhas is widely seen. The village women decorate their Abhas with golden and silver thread work. While the gold and silver threads. The commonest type of dress worn by males in rural areas consists of cotton drawers called 'chorno' and a short 'kediyu' or 'angarakhu' covering the upper part of the body. Most of the people especially agriculturists still continue to put on the typical head dress, thickly folded 'phento' or turban. Women in villages put on 'chaniyo' the coloured petticoat often embroidered with 'abhala' or glass pieces, a similarly embroidered blouse or bodice called as 'choli' or 'polku' along with 'odhani', a coloured piece of coarse cloth covering the body and the head. Elderly males of higher classes put on 'dhoti' (waist cloth) and 'kafani' or 'peharan' (shirt). Gujarati males generally wear dhoti, long or short coat and turban cap. Nowadays, pants are becoming common instead of dhoti. The women wear sari and blouse. Parsi males wear pants, long coat and a headgear. The Parsi women's clothes are identical with those of the Hindu women with a slight difference marked by long sleeves of the blouse and a scarf on the head. Ornaments are used by both males and females since ancient times. In the past, certain ornaments were commonly used. These included 'kanthi' worn round the neck, silver 'kandora' worn round the waist and a 'Vinti' (ring) worn on one or more of the fingers. Women in rural areas generally put on heavy silver ornaments.